Holy crap! Sunday was not all that much fun. I had a few hours to devote to Range Rover Classic Restoration Part Duex. I started with sanding the tailgate. I’m not sure if you have ever done any paint work or if you have watched any of the dozens of car shows on television. But when you see them sanding, and sanding, and sanding, there is a very good reason for that. When you take paint off a panel you often have to remove the paint and primer down to the metal. Once you do, you can see how thick the paint is on the metal. I noticed this on the tailgate and remembered watching Edd China on Wheeler Dealers BBC America, sand the panel before he painted it. The basic idea here is to reduce the lip of the paint. Sanding it down makes the edge disappear. Well very nearly disappear anyway. This is not a show car and I am not a paint and body guy. So I sanded the edge down on all the bits where it showed. I think I did a pretty good job but I know I could do better but I thought the time was better spent somewhere else. So I finished sanding, checked the edge and touched it up again. Then I wiped it all down with paint thinner to remove the dust and I covered it with more acid etching primer. The next step on this is to buy the paint to cover the tailgate and rear panels. I then set out to get the differential out of the axle. To do this you need to remove the drive shaft. As I tried to do this it seemed like every one of those nyloc nuts would round off. Frustrated I finally decided the drive shaft would come off at the differential. I latched the vise-grips to each nut and went to wrenching or socketing whatever. With the drive shaft out of the way, I started on the nyloc nuts on the differential. Luckily they did not round off. I positioned the hydraulic jack under the differential and had my trusty helper RovErica lower the jack. That didn’t work out like I thought it should. I just had her let it go and I manually wrangled it to the garage floor. Let me tell you it doesn’t take many of these projects for you to appreciate the weight of some of the parts of the Range Rover. 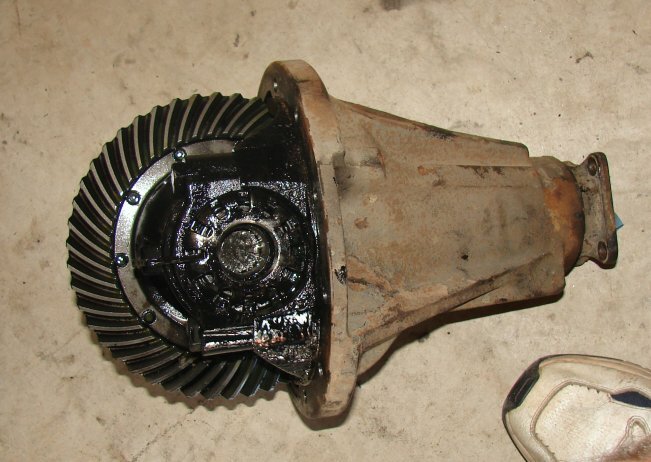 The differential is a very dense and heavy bit of the Range Rover. I totally underestimated my upper arm strength and its weight. The good news after it was out, I only had one busted up finger so I feel fortunate. Although sore, that finger was still functioning, so bonus. I was pretty spent when it was all said and done as evidenced by this picture of me. I looked at the differential and there locked deep inside was the end of my axle shaft. I piddled around trying to get it out but nothing worked. It took me modifying an old screwdriver into a punch of sorts. I placed it on the broken shaft and started banging away gently persuading it out with a one pound hammer. You can well imagine with the heat generated when a shaft spins in two, that it would be stuck. Think heat expansion properties and bendy metal. And stuck it was. Finally after quite a few whacks the tip came out. You can see in the picture that there was some serious stress involved in breaking that shaft. I talked to RovErica again to see if she remembered what might have occurred during her driving that might have caused it to break. I took her back to when she remembered the front wheels starting to chirp. 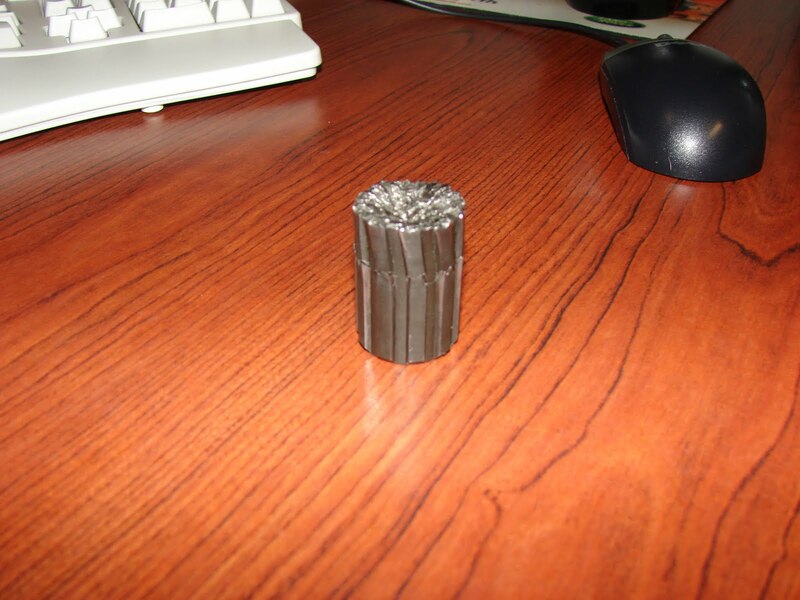 The chirping tires were the result of the viscous coupling failing post drive shaft failure. She recalled two episodes where she drove off the road why coming home from a friend’s home in East Norman. She said one of those resulted in the Range Rover leaving the road and her coming to a halt sideways. Or that’s how she told it. Either way this could have been the event. My friend who served in the Oklahoma Highway Patrol told me the spin out maneuver they employ to stop cars often breaks the drive shaft or at the least the drive train. Good work RovErica. 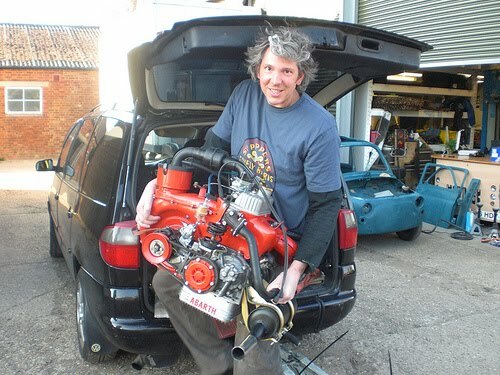 I called my pal JagGuy and asked him if there was anything I needed to do to the differential before I reinstalled it. He started talking about limited slip differentials and the fact that if it was limited slip the clutches would be totally hosed. I mentioned I could not see anything like that but he was insistent. I also looked at Atlantic British and Rovers North for parts lists for the differential. Neither of them listed any part for the differential that could be for a limited slip. I got on the RangRovers.net message board and asked if anyone knew one way or the other. Danny from West Wycombe, England and James from Wisconsin offered some wisdom on the differential. Danny lives in what looks like from Google Maps an ideal place to own a Land Rover. I’d love to know if he lives in this estate. Hell Fire Caves looks like a lot of fun. I pretty sure they have a little bit of money. That looks like an incredible place to live. CHECK OUT THAT CARRIAGE HOUSE! There are even ponies on the polo ground! I can just imagine greenlaning around that great property in my Land Rover. Equal billing for James leaves me with this remembrance. The last time I was in Wisconsin, I was driving around in an M54A2 6×6. I don’t see myself putting that back in until then and that gives me plenty of time to confirm everything. I do not want to take it out again. While it’s out I think I put my angle grinder to work and give it a lovely coat of primer gray. I will also investigate some synthetic lubricant for the refit. I cleaned out some nasty stuff from the “pumpkin”. As you can imagine the last bits of the axle and all the fine bits that were ground off wound up in the bottom of the reservoir. The axle lube was a lovely silvery color. This is what initially tipped JagGuy off that a clutch was eaten. We shall see. This entry was posted in differential, England, JagGuy, Marines, paint. Bookmark the permalink.